I know I am difficult to work with; but ‘hey ho’ when you are in the big wide world, you will work with a lot of people who are more or less difficult than me! Again many thanks, hope you have learnt a lot while you have attended! "E' Natale e a Natale si puo' fare di piu'"-"It's Christmas and for Christmas you can do more"
I'm creating the database for David's Christmas card project. David asked me if I would like to choose a card and have a special message placed upon it. I chose the song 'A NATALE PUOI' from the artist Bebe's album "Christmas Piano". It's a popular song which I remember as a child which is used constantly by advertisers. You can hear it from here. Sto lavorando al database per il progetto dedicato alle cartoline di Natale di David. Egli mi ha chiesto se mi avesse fatto piacere scegliere un pezzo dell'albero ed avere un messaggio speciale su di esso. 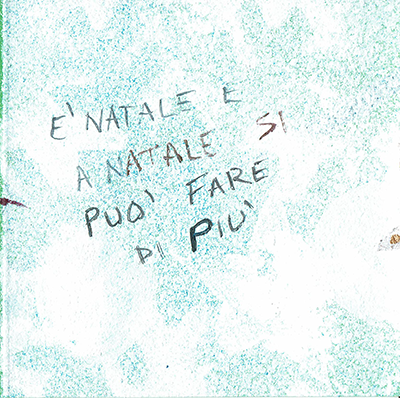 Ho scelto la canzone 'A Natale puoi' dall'album "Christmas Piano" di Bebe. E' una canzone popolare in Italia durante il periodo natalizio che ricordo da quando ero bambino dato che viene costantemente usata nelle pubblicita'. Potete sentirla da qui.